3D Systems, one of the largest 3D printing companies in the world, announced yesterday its collaboration with Huntington Ingalls Industries’ Newport News Shipbuilding division to qualify the metal 3D printing technologies to be used to manufacture naval warships. Currently, Newport News Shipbuilding is the only designer, manufacturer and refueler of U.S. Navy aircraft carriers and one of two providers of U.S. Navy submarines. This collaboration will help the Newport News Shipbuilding to transform the traditional manufacturing systems to additive manufacturing methods for enhanced production capability with higher accuracy of parts and reduced wastage. This will indirectly reduce the expenses incurred in shipbuilding processes making the process much more efficient. The first phase of the collaboration involved the installation of a metal 3D printer at the Newport News Shipbuilding’s manufacturing plant. 3D Systems installed a ProX® DMP 320 metal 3D printer. The metal 3D printer will be used to manufacture marine-based alloy replacement parts for castings as well as valves, housings and brackets – for future nuclear-powered warships. To further enhance the part production, both the companies are already trying to develop newer additive manufacturing technologies in addition to using metal 3D printing. 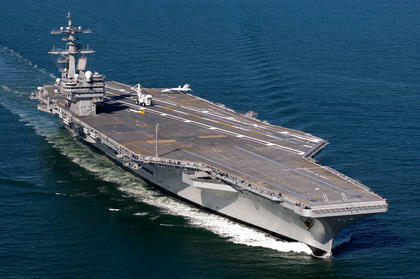 3D Systems is involved in providing metal 3D printing solutions and expertise to U.S. Navy since decades. 3D printing is being used from aircraft parts to submersible components. 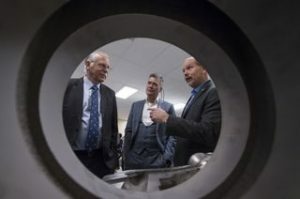 The latest collaboration will focus on joint R&D activities to develop a standard metal additive manufacturing processes to build components for nuclear-powered naval vessels. Virginia-based Huntington Ingalls Industries (HII) is the largest military shipbuilding company in the U.S. and a provider of professional services to partners in government and industry. HII’s Newport News and Ingalls shipbuilding divisions in Virginia and Mississippi are building ships for more than a century. HII employs nearly 39,000 people operating both domestically and internationally. About Manufactur3D Magazine: Manufactur3D is an online magazine on 3D Printing which publishes the latest 3D printing news, insights and analysis from all around the world. Check out our Global News page for more 3D printing news from the World. To stay up-to-date about the latest happenings in the 3D printing world, like us on Facebook or follow us on Google+.